Grow Your Nonprofit Agency - Ron Woodbury Consulting, Inc.
We must grow, or we will wither in the wind. But, we must manage growth, or growth will manage us. What does growth mean to your agency? I suspect you want to grow your nonprofit agency by increasing membership, donors, clients, or funding bases. And, you need to grow in a cost-effective manner, as each has an acquisition cost; as does growth in services or support assets (facilities, staff, etc.). Growing grants even costs money (internal staff or outsourced). Prioritizing your growth areas and supporting strategies will help you more effectively manage your agency’s growth. If you sat down with your board or management team and asked “Why do we need to grow?” or “How can we grow our agency?”, what do you think would be the result? What would people think of first? Ability to serve clients, fundraising dollars, number of donors, members, volunteers, grants, services, facilities, capacity, etc.? 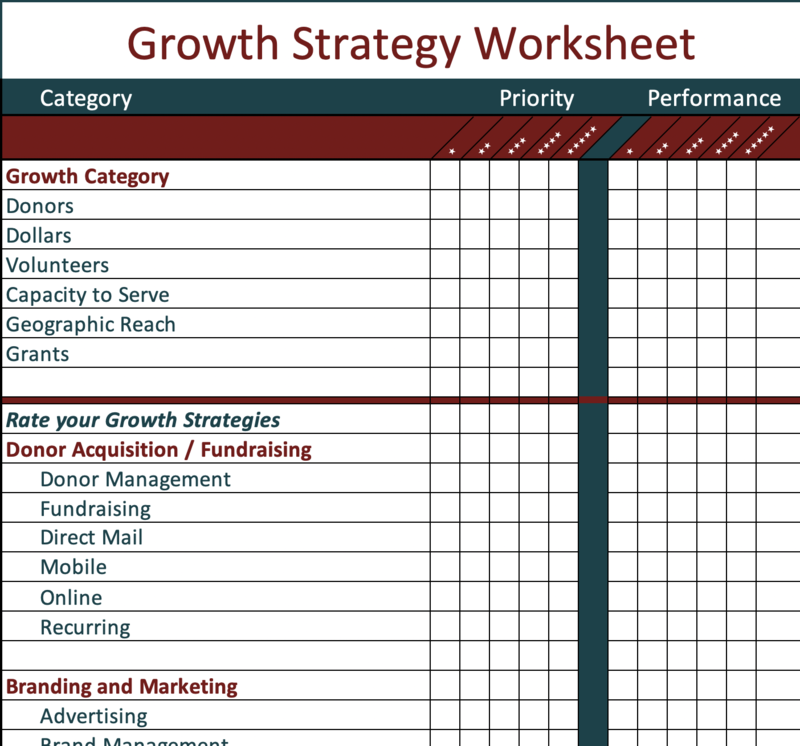 In this article, I’m introducing a simple to use tool that can help you clarify your growth areas, and better understand the priority and performance of each of your growth strategies? To use this model, you simply rank the importance (priority) of the areas you wish to grow. Next, identify the performance of each item. Now, look for areas with high priority and low performance. This will help you prioritize your efforts. Now, do the same for your growth strategies. As before, we rank the priority and performance. To find the low-hanging-fruit, we look to those strategies we feel are important, yet lack high performance. This helps to clear away the noise and help you focus on the few strategies that will help you effectively and efficiently manage your growth. I’m a big fan of business tools that can help clarify your tactics and strategies. I hope you find this tool useful. If you would like the source spreadsheet, please contact me. This entry was posted in Business Planning, Continuous Process Improvement, Marketing Strategy, Strategic Planning. Bookmark the permalink. ← Time to Ditch the Weekend Planning Retreat?